Having just migrated from the impressive new Astra, the footprint of Nissan’s all-electric LEAF hatchback feels very familiar. But that’s sort of where the direct comparisons end, given the Astra delivers extremely low CO2 emissions while driving, whereas the LEAF puts a zero in that column. And it’s tough not to feel a little smugly superior, sat next to other drivers with internal combustion engines idling away in traffic – which I seem to do a lot – and thinking they represent the past. 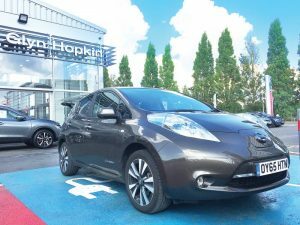 In truth, this feeling is strengthened by how brilliant the latest LEAF (with the 30kWh battery – increased from 24kWh) is on the road. That extra 6kWh makes a huge difference to the car’s usability, offering a realistic 135-plus miles from a full charge, and helps allay range anxiety fears. Previous: A new era for electric vehicles?